All I can say is that it’s a long way to Rome. A 5 hour flight from San Francisco to Atlanta, then a 10 hour flight to Rome means a lot of sitting and not a lot of sleep. It’s 3:00am Tuesday in Rome and when the alarm goes off at 6:00, I shall regret picking up my phone over an hour ago. But for now, I can’t sleep, so may as well be productive. 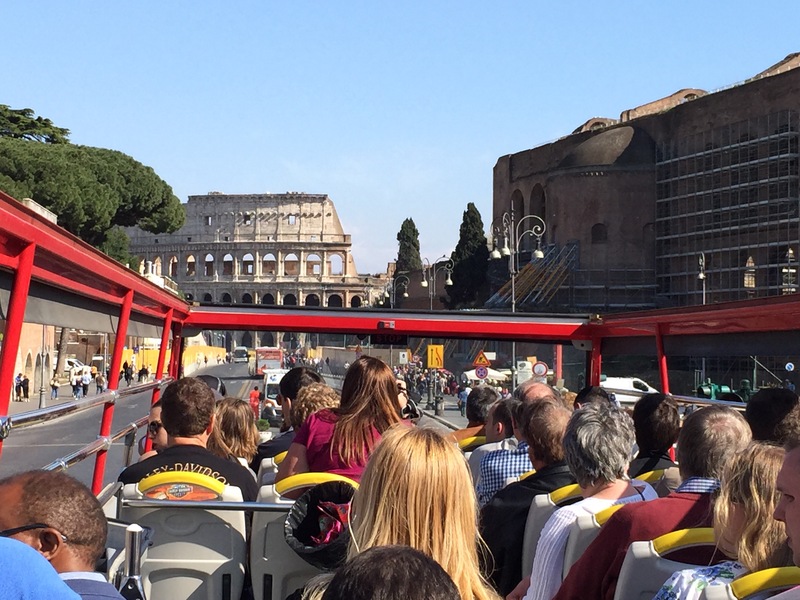 We arrived in Rome mid-morning Monday and were met by rail representatives. They arranged for a bus trip to the hotel, got is checked into our rooms, and bid us farewell for the day. Our group of 10 split, with 5 of us taking a Hop On Hop Off tour of Rome, we were all sleep deprived so it was nice to do something low key. Terry and I found ourselves nodding off more than once. 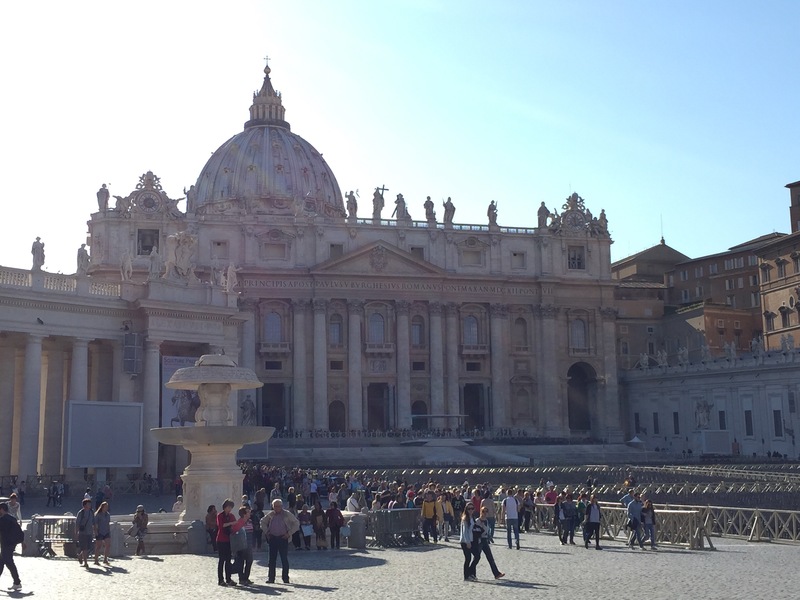 At St. Peter’s Basilica we got off and walked, had a lemon ice, bought postcards and such. Found out later it costs nearly $2.50 to mail each postcard home and takes forever. I may send them home with one of the Ftesno gang who will leave this weekend. If you get a postcard postmarked Fresno, don’t be offended! 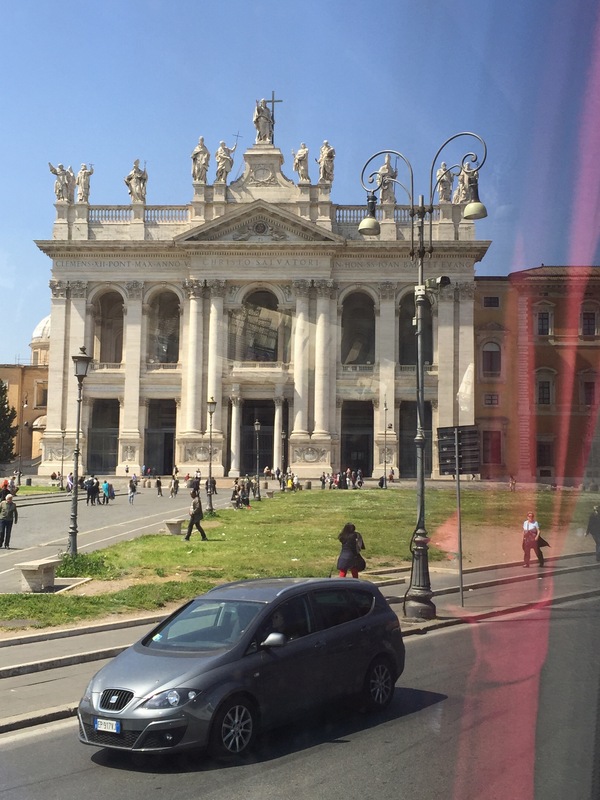 Rome is amazing with the ancient city and modern buildings side by side. The traffic reminds me a bit of NYC and there are tens of thousands small cars. Certainly no SUVs like America is so proud of. Random pictures because we have t uploaded from the camera yet. Now I need to really try to sleep so I’m not nodding off on Tuesday. I managed to catch a cold the day before we left, but I refuse to let it spoil my fun. Up next: riding high speed train to Bologna and then over to Milan overnight! Yes, it is a LONG way to Rome. I hope you can adjust to your new time zone. Sounds like you had a good first day, despite the flight! Excellent! I’m so happy I am following the coolest blog ever! In addition to my senior seminar blog of course! 💁🏼 I like reading about your day since I can’t call or FaceTime! 😔 I love you! Aww Layne, that’s pathetic. I love you!